Overnight, while we were sleeping, Britain voted to leave the European Union and our investment account, along with all of the US financial markets, drastically plummeted. Over breakfast in the elegant Kokusai Imabari hotel, sitting in front of a beautiful Japanese garden, we talked about the ever changing currents of the world, government policies, and the prevailing fears that constantly interact to produce the ebbs and flows of global economic and political trends. We have come a long way since we used to worry about our accounts. We no longer worry about our personal finances, since we know that all the ups and downs are a part of an ever-zigzagging path of putting your money on the pulse of the global environment. We’ve seen our accounts go up and down and surfed those global political waves so many times, that we no longer hold our breaths. We know that we are blessed children of Grace, and that we will always enjoy a great life full of blessings. After a few days of walking ahead of our pilgrimage route, we have already walked between all the temples of Imabari, and even some of the temples of the next city of Saijo. Our walk was a little chopped up and out of sequence, because we retraced our steps to get back to our hotel each night, but in the last two days we’ve managed to visit many temples. All of those temples were old and full of history, and many legends are connected to them. In temple 59, if you shake the hand of a life size sculpture of Kobo Daishi, all ailments you have imagined you might have, will disappear. Some ancient temples that used to be surrounded by rice fields and rural villages, stand now in the middle of busy roads and lack some charm, while the high hilltop temple #64 was surrounded in mist when we arrived there, and looked like a place where real miracles can occur. We’ve temporarily skipped temple 60, which is a Nansho, which means that it is located on one of the peaks of a high mountain called Ishizuchi, so it requires a long full day hike up and down. We’ve skipped it for now, because I did not feel well enough to climb a mountain and because it has been raining so hard in the last few days, that we decided to wait for a dry day before we attempt this hike. Luckily, there is one single dry day scheduled for the time we allotted to be here. On the day that we left Matsuyama, I woke up feeling better. My throat was no longer sore and my fever had disappeared. I was no longer achy and obviously getting much better, but I still felt very weak. We’ve booked a room for three nights at the elegant Imabari Kokusai Onsen Hotel. Since we have already walked ahead on our route, having visited some of the temples of Imabari yesterday, and in consideration of the fact that I was still very weak, we took the train to Imabari, effectively cutting 34 kilometers off our walk. We did not really feel like we were cutting ANY distance off our walk, since we have already walked 150 kilometers OVER what we’re supposed to have walked on the pilgrimage route by now, according to our book of maps. Besides…. it was raining so hard…. Since I was still feeling weak, it did not feel right to be walking in the pouring rain with my heavy backpack. I felt it would be best to allow me to heal with more ease. In Imabari station, we looked for coin lockers to leave our backpacks and start walking, but they had none. So instead we checked in early at the Kokusai hotel. The woman at the front desk spoke perfect English, and the hotel has a large lobby with lots of comfortable seating. Our “Western Style” room is elegant with a nice design and comfortable features. Our windows overlook the city of Imabari, the Inland Sea, and all the surrounding mountains in a panoramic view. The hotel also has a large Onsen which we use after our long days. For us, vegetarian food was not easy to find in Imabari. Most places serve meat or fish, and many of the places looked dingy or were closed altogether, although it was not a holiday, so we can’t tell if they were even still in business. We found a small cafe that served food. It was called “Back to school cafe,” and it was run by one young man who was the owner, chef, barista and waiter. We ate at his place twice and he made us good coffees both times. This afternoon, as we returned from our walk, it started to rain. Since we were near the hotel, we did not take our folding umbrellas out of our day packs, but were walking under street awnings back to our hotel. Suddenly this nice young man from the “Back to school cafe” stopped his car in the middle of the road, jumped out, and gave us his umbrella. We tried to refuse, and we were a little stunned at his appearance out of nowhere, but there was no time to argue as his car was blocking the traffic, so we thanked him and took his big umbrella. Even though he intended to gift us his umbrella, we plan to return it to him tomorrow on our way to hike the Nansho temple on top of the mountains, or the day after when we leave town. It’s funny to realize that we stick out a little in Imabari, since we are the only two gaijins (foreigners) walking around town. We are very noticeable, even without wearing our pilgrims’ jackets and hat which we have left behind in our hotel room the past two days. The same woman at the front desk who spoke great English, also helped us to book places to stay for the next week of our pilgrimage route. There are not going to be any great places to stay, just roadside hotels or business hotels, a few simple Ryokans and simple guesthouses. We thanked her a thousand times for her kindness and help. She helped us book places all the way to Takamatsu, which is the end of our pilgrimage. In Takamatsu, we can book hotels online by ourselves. Near the Imabari Kokusai hotel, there is a large mega shop selling beauty supplies. I bought some Aragan oil and apricot oil for my hair and face. We also bought there some nuts and raisins to take with us for our long hike tomorrow up to temple 60, aptly named Yokomineji –Temple on the Mountain Ridge. Tonight we had dinner at the hotel’s Chinese restaurant. We chose the dishes carefully and asked them to omit the pork and make it with vegetables only. After dinner we walked over to the Circle K convenience store and bought double portions of ice cream. Nobody is going to lose any weight on this long pilgrimage, that is for sure…. 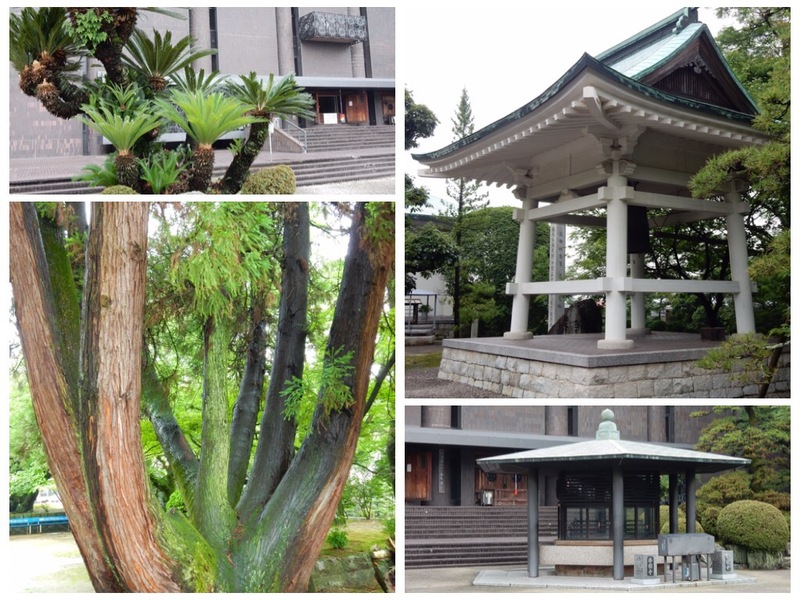 The name Kokubunji is given to each of the official prefectural temples. There are four official state temples located on Shikoku, one in Awa/Tokushima, the second in Tosa/Kōchi, the third in Iyo/Ehime, and the forth in Sanuki/Kagawa. It was built by Gyōgi in the year 741, who also carved the main deity. The honzon is also attributed to Gyōgi. Kōbō Daishi stayed here and painted a painting of five great deities for this temple. There is a Shinto shrine next to it and a stone life size statue of Kobo Daishi, that is known to heal people if they shake his hand and pray in front of it. In this temple we wrote birthday wishes to Linda, Jules’s sister. We wrote the wishes on some Osamafuda slips which we deposited in the temple’s boxes. Those Osamafudas are burnt in a fire ceremony once a month, to send the wishes of the pilgrims to the Heavens. The temple was originally founded in the middle of the 6th century. Gyōgi spent time here in the 8th century and Kōbō Daishi in the 9th century. Kōbō Daishi made a vow here to protect children, ease child birth, and to devote his life to helping others. He also said that women must be allowed to become Buddhas (Nyonin-Jobutsu), at a time when most Buddhist temples did not even allow women to enter the temples. Locals believe that coming to light incense and pray here, will ease a woman’s child-birth or enable couples to have children. Temple 61 was rebuilt in a modern style that was very different from the ancient architecture of other temples on the pilgrimage. On a grey day when we visited, it looked austere and a bit like a government building from the Soviet era. But on the same austere temple’s grounds, stood a very old tree with many majestic branches in many mossy shades of green that looked so organic and beautiful. Built by Kōbō Daishi for Emperor Shōmu as a place to recite the sutras while in Iyo Province. The Kannon image here was also carved by Kōbō Daishi. The temple was abandoned in the early Meiji Period and restored by a Henro named Ryūhen in 1877. Today it is a small temple with almost no garden, standing on the edge of a busy road with lots of cars passing by. The three statues of Bishamonten (the god of wealth), Kichijōten, and Zennishidōji were all carved by Kōbō Daishi. The temple was once located on the summit of the mountain, but after being destroyed in a war, it was rebuilt at the present location. The temple’s name Kisshō or Kichijō is another name to the female deity of the honzon, the Hindu goddess Lakshmi. In the garden, there is a boulder with a hole in it. It is believed that if you approach it with your eyes closed and are able to pass a stick into the hole while keeping your eyes closed, your wish will come true. This was my favorite temple in the Saijo area. Located up the lower peaks of Mount Ishizuchi, it was founded by Gyōja while he was doing his ascetic practices on Mt. Ishizuchi, the highest mountain in western Japan. During his practices, both Sakyamuni Buddha and Amida Buddha appeared to him in the form of Zaō Gongen, the Shinto God of the mountains. There is also a beautiful Shintō shrine on the temple’s grounds and all the buildings were built in the architecture of a Shintō shrine. Kōbō Daishi once spent 21 days on the top of Ishizuchi Mountain performing a Goma ritual.